Iris Belshaw has returned to living in her native Northern Ireland following a successful and rewarding international business career. As an emerging artist she has exhibited and sold her large pieces at art exhibitions in Belfast and Dublin. She also has a regular demand for commissions and is hoping to host her own exhibition early next year. Her success has taken Iris by surprise as she felt she had retired from an enjoyable career only to find a contrasting fulfilment in a completely new aspect of her life. She currently restricts her work to making sheep and goats having been inspired by her own flock of Jacob sheep when she ran a small farm in the Isle of Man. 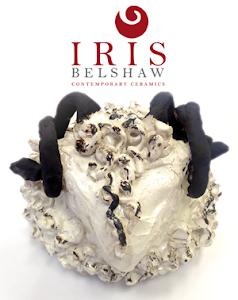 She loves working with clay and the uniqueness of each piece develops as it is created, there are no rules or decisions made at the outset and as a result each piece has its own personality.